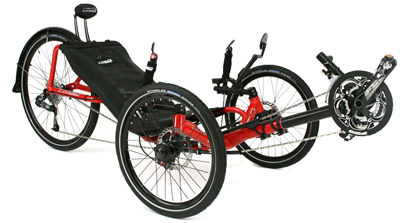 The Catrike Expedition is the paradigm for sport-touring trikes, offering a perfect balance of performance, accessibility and value. Ride this first. Our best selling model, the Expedition has a 37° seat recline and a larger 26 inch drive wheel. This gives both a more aerodynamic profile and a higher range of gears. The wide track and cushioning effect of the larger rear wheel make this a favorite model for fast descents. Despite its name, you shouldn’t think of this trike as being for loaded touring unless you reduce the low gears a bit. The Expedition is built for speed. It comes stock with Catrike’s lightweight and adjustable neckrest, which we can also fit on any Catrike. Why does it sell so well? It is an excellent balance of performance, value, and ease of use. There are lots of trikes out there, and lots of trikes in here, in our showroom. No one trike fits all needs, but if you can only try one trike then try an Expedition. 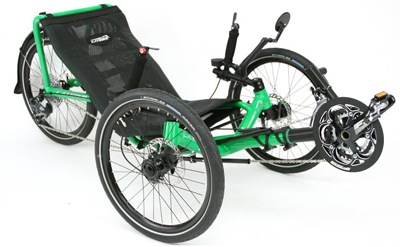 Other makes and models of trike may exceed the Expedition in one feature or another, but this trike is the paradigm. The Expedition is a long wheel base Sport-Luxury Catrike. Capable of handling heavy loads for long distance touring and a fast performance ride. Neckrest - Not as essential as you might think, but a nice addition. Normally this is a $125 item.